Submersible arrangements make stunning table centerpieces for a party or special event. In such arrangements, individual blossoms or stems of flowers are supported in clear glass vases or cylinders. Stones, marbles and seashells may be added to cover a clay product that holds the floral stems in place. Several types of flowers can be successfully used in submerged flower centerpieces. 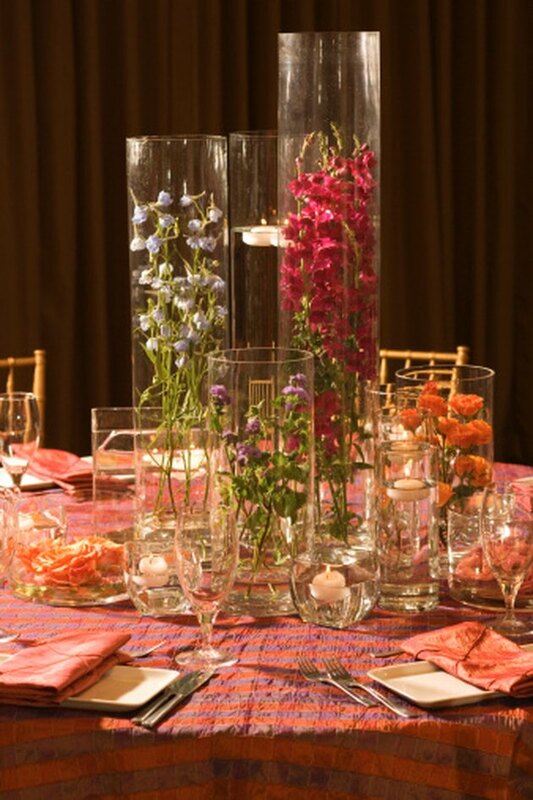 A submerged centerpiece is arranged in glass vases and cylinders. Tulips are particularly versatile in a water-filled centerpiece, as their stems are easily curved and bent to rest under the colorful petals. Additionally, the large, colorful blossoms display beautifully in clear vases. Anthuriums are another flower with a pliable stem that can encircle the container interior for a tropical wedding centerpiece. The bright red or pink heart-shaped leaf and yellow spadix filled with minuscule flowers are magnified by the thick glass and water. Cymbidium, mokara and dendrobium orchids are elegant flowers to place in submerged centerpieces for weddings and formal events. They are more costly than most flowers but single blossoms or sprigs can be used if the budget is tight. Calla, Asiatic and oriental lilies are also beautiful in such centerpieces; they are available in pink, yellow, orange, red, lavender and white colors. A singular large blossom can be used in a short vase or a series of blooms can fill a tall cylinder of water. Large exotic protea blossoms make an impact when used as submersible flowers in an underwater arrangement. Roses and gerbera daisies with multiple thick petals and woody or solid stems are sturdy flowers for submerged floral arrangements. The straight stems allow you to cut and arrange the flowers at various heights within the glass container. The stems can be inserted into a stone, marble or glass filler that will hold them in place in the water for hours. Additionally, gladiolus spikes are sturdy stems and blossoms that fill large vases for quick assembly yet stunning submerged centerpieces. Thin glass vases can be used to display delicate cherry or apple blossom twigs. The small blossoms can be highlighted with battery-operated lights or a candle topper. The florets of lavender, pink, white or purple lilacs can also be submerged for a centerpiece. For a romantic touch, mix white roses into a large display. Color-fast and waterproof, silk flowers are a possibility for the submerged flower centerpiece. Test the flowers first to be sure that they will not bleed color into the water-filled container. Silk replicas of delicate flowers can be purchased to match the floral theme for the occasion. The wired stems allow for easy manipulation of the flowers in the vases before they are covered with water. For an even more striking display, different types of blossoms can be attached to one stem. For instance, roses and lilies can be assembled together on one plastic-coated wire stem.